We were really pleased with the popcorn machine and the candy floss machine, and will not hesitate to use you again for future exhibitions.Nina BurnsMarketing CoordinatorTalar Made Ltd.
Hello. We just wanted to say a huge thank you for the entertainment provided at our wedding. The rodeo bull went down really well with our guests and the children loved the candy floss machine. The chocolate machine was delightful. Your staff were exceptionally professional and well dressed. Thank you again! We recently sat down looking at our range of bouncy castles trying to come up with a new theme. We wanted something fun, something bright, something unique and something that would be unisex. Sure we have plenty of character castles, plenty of generic castles such as Circus and Animals – but this one has ticked just about every box imaginable. Welcome to our New ‘Happy Balloons’ bouncy castle. It’s charming, fun, colourful and just about perfect for every kids party. Our stunning bouncy castles come equipped with all the necessary equipment needed for setup and we will do it all for you. You will also receive safety instructions with all the precaution measures. At just £55, the e price includes delivery, set up, inflation and collection as well as all the necessary equipment to make it a fun day. Just give us a call or send us an email, or even use our contact form. Of course, for delivery at home, do make sure to remove all the garden items such as patio furniture, swing sets and the like, so we can set up everything without unnecessary delay. 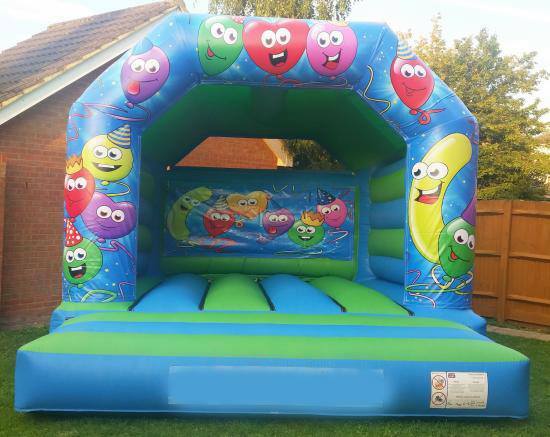 If you throw a party with a bouncy castle as a surprise, you’ll be a star and all your guests will be delighted, no matter whether child or adult, there will be enough fun to go around.